When interviewed in 2000 Bishop explained that he asked the two leaders to re-create the handover away from the shaded shed where it took place, saying: ‘We'll get away with a nice blue sky behind it. I asked Mr Whitlam and Mr Lingiari to do it again, and so they did.’2 This image became an icon of the land rights movement in Australian political photography. The bright blue sky and red earth gives an immediate sense of place. The years of struggle are engraved on Lingiari’s face and slightly bent back, whereas Whitlam stands confident and optimistic. 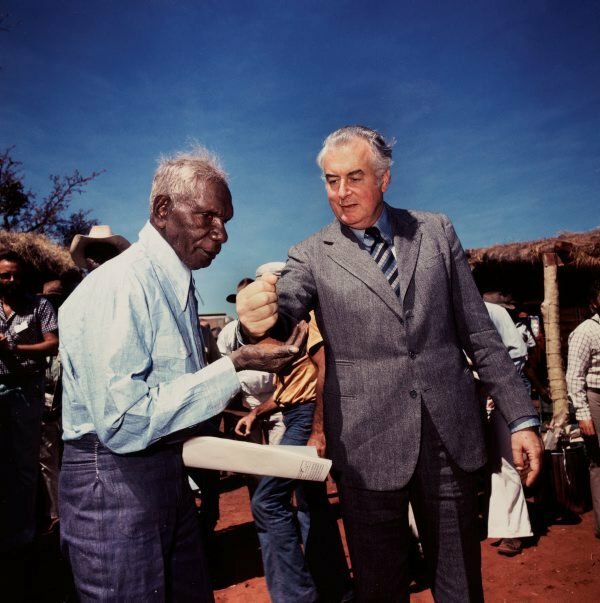 The white papers and words are meaningless compared to the physical action of the dry red earth falling from Whitlam’s hand to a growing mound in Lingiari’s palm. In a few minutes the two hands in the shape of an hourglass symbolically rectified the years of injustice for the Gurindji people by giving them access to their ancestral lands. © Mervyn Bishop/ Department of the Prime Minister and Cabinet.